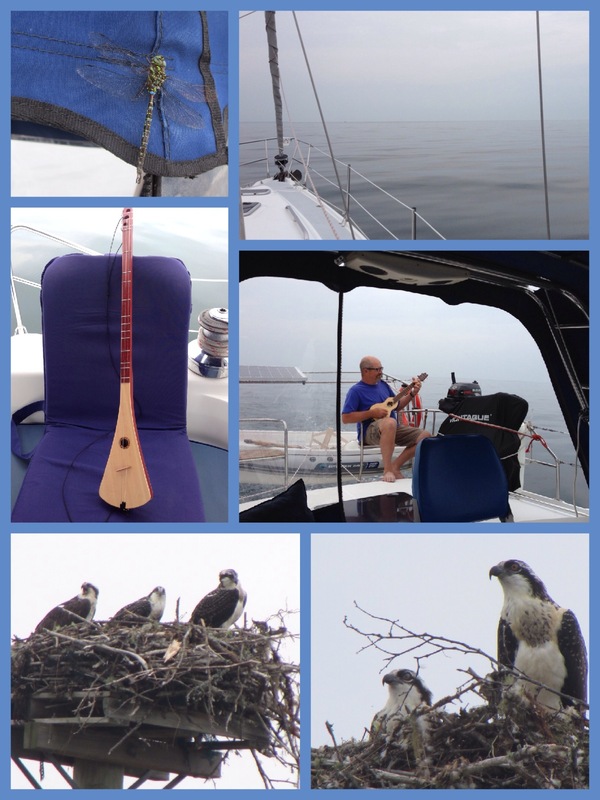 June 11th, 2015 – The Split Crow is in the water! It has been quite some time since I’ve written on the blog so I will try and get everyone up to date by writing the condensed version of what we’ve been up to since September. 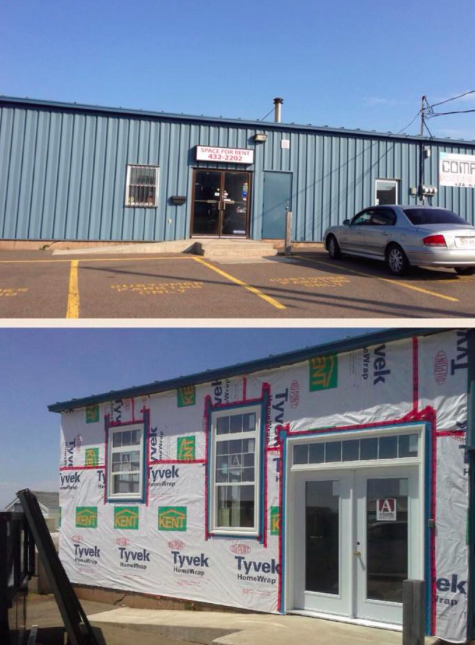 We bought an industrial building at 360 Water Street in Summerside, PEI. If you check it out on Google Street View, you’ll think we were crazy but we were given permission from the City of Summerside to turn it into our residence. The building is right on the water (the Summerside Harbour which leads out to the Northumberland Strait) and right downtown. It was exactly what we were looking for even though it didn’t really resemble a house. Dennis was the one who saw the potential of the building and we are now in the process of renovating it. Thanks to a number of Summerside people, Jeff Barry, Wilfred Smith, Scott Buchanan, Roy Kilbride, Denis the painter and especially William Jones (I will write an entire post about William in a few days but needless to say, he is one amazing carpenter! ), the place is looking awesome! We should be able to move in at the end of July. We bought 360 Water Street in August of 2014 and once the deal went through, we put the Split Crow away for the winter (in Souris, PEI) and went home to get ready to sell our house in the spring. 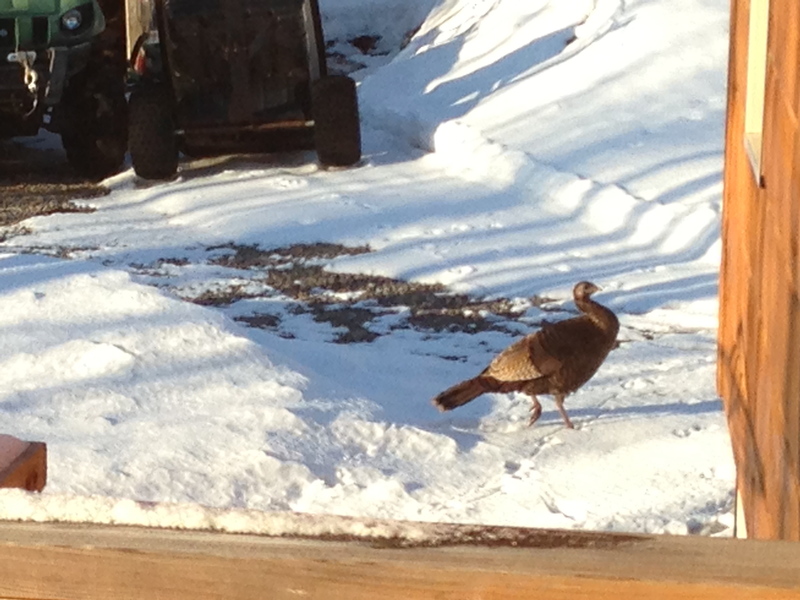 Within a week of being home, we got an unexpected visit. Janice Hughes, the owner of Hughes Communications, had a boat to cottage on Trout Lake but was thinking that she would like to move to a more permanent location and had heard that our house was going to be for sale. She looked around and I knew within five minutes that she was going to buy our house. Long story short, she did and is very happy there roaming the trails with her dog Daisy and paddling around in Crow Lake. Here are the pictures of the place that I posted on Flickr. We spent the entire fall, winter and spring getting rid of most of our belongings. Dennis had quite a bit of worldly goods that he had to “thin out”. He was going from 23 acres to about 50 feet so there was no room for his collection of treasures. We finally managed to get rid of a lot of stuff, loaded up the rest in a 20 foot U-Haul and headed out on June 2nd for PEI. We arrived the next day in the evening and just about froze! There was a frost warning out – yikes! Over the next two days, we unloaded our belongings into two storage lockers and basically got in William the carpenter’s way because we were so impressed with the work that had been done. We could not believe the transformation. I will post pictures of it on a later date. At 360 Water Street, part of the building is rented out to a computer company – LiveTechs. The owner, Allan Ramjattan, has been very patient with the construction. He is a great guy and so easy to get along with. The other part of the building used to be rented out to a hair salon but we will be turning that into Dennis’ workshop for our very small business, the PEI Wooden Spoon and Sewing Company. We suspect that there were a lot of people wondering what we were up to. Somehow, (thanks William :)) we were interviewed by the Journal Pioneer. Here is the article. Finally, finally, on to the boat! We have officially moved onto the boat for the summer and will be bringing it to Summerside on Saturday and Sunday if weather permits. The boat went in the water today and we are very comfortable on it. 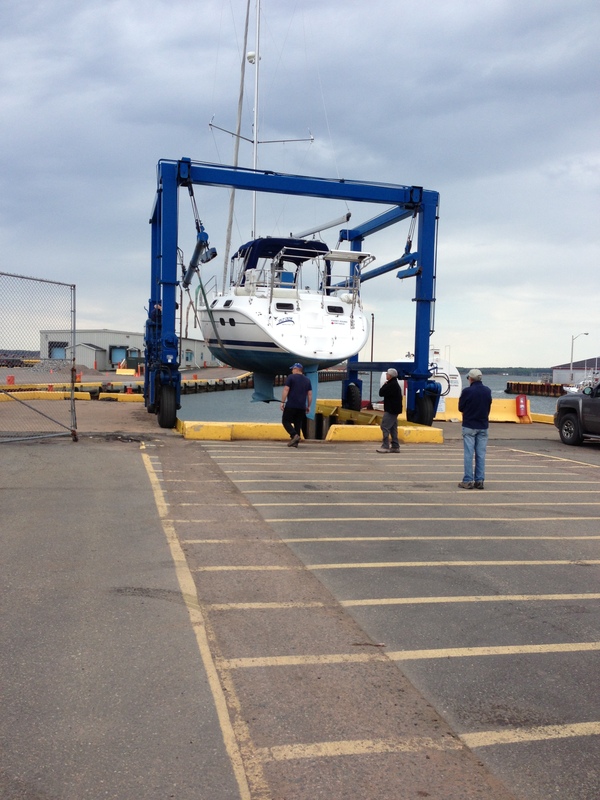 Here are a few pictures of it being moved from the yard to the water. Posted by JH on June 11, 2015 in Everything Else! Needless to say, it was an uneventful day. We spotted a few seals and one whale (we think). We did have a passenger – a beautiful dragonfly which is still hanging on to the canvas. I’m not sure if it’s sleeping. We amused ourselves today by playing the new musical instrument – the strumstick. It is really easy to play – no wrong notes. In the pictures below, you’ll see it. You can also see Dennis whaling away on his traveller’s guitar. I have to say that a boat is a great place to practice – nobody can hear you! Of course, upon docking at Wood Islands, we went over for our lobster rolls at Crabby’s. They were delicious! And I had to go and see how the ospreys were doing. They have really grown since we were here last. I didn’t get to see them fly but maybe next time when we stop in. So, I don’t have any other news. We are off to Ballantyne’s Cove tomorrow. Posted by JH on August 2, 2014 in Everything Else! We picked a good week to stay in Summerside because the Lobster Festival is on. 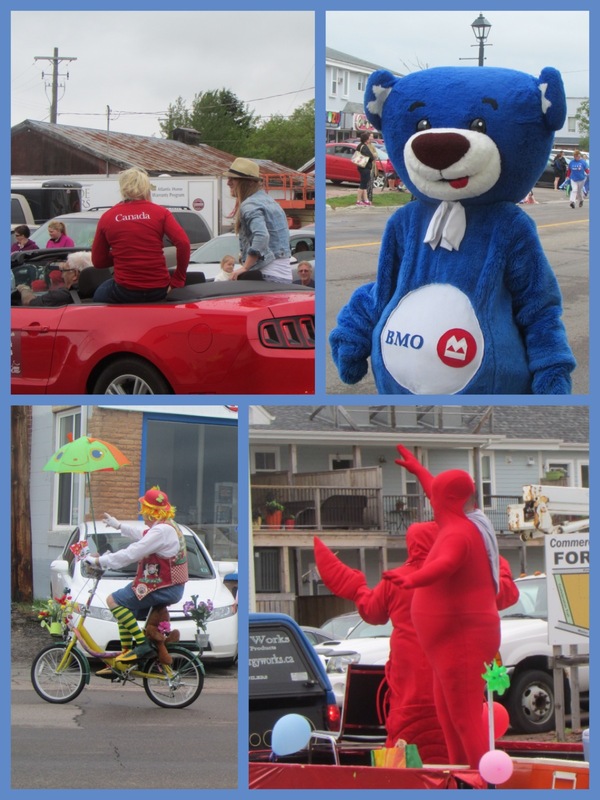 We’ve been enjoying all the activities – lots of outdoor concerts, all sorts of vendors and tons of things for kids to do. Monday was the parade. Of course, it poured rain all morning but finally at 1:00, the rain let up (just in time for the wind to blow a gale) for the parade. There were 80 floats in all – the highlight being the giant lobster. I thought that the wind would take it away but it did not although its giant claws were waving wildly! One of the highlights was seeing Heather Moyse, the Olympic bobsledder from Summerside. Here are a few pictures. That’s all the news for now. We are expecting company from Canmore tomorrow – looking forward to a visit with my parents. They’re driving around in a rented RV. Pretty windy ride, I bet! 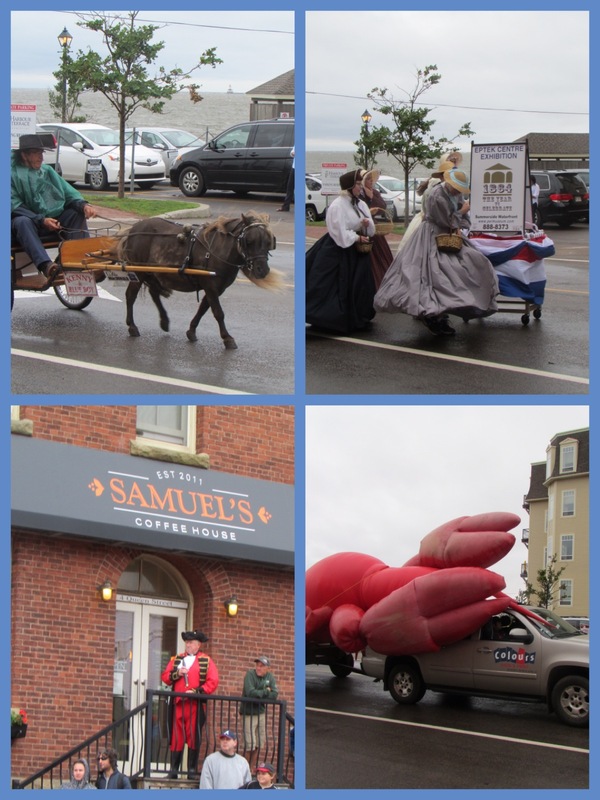 July 1st – Happy Canada Day from Souris, PEI! I wasn’t smart enough yesterday to go for a bike ride early in the morning and had quite the workout in the blazing sun at noon hour. Today, I went for a great ride very early and was back by 8:15 – just in time to do boat chores. 🙂 I took some nice pictures this morning of Souris and the surrounding area. 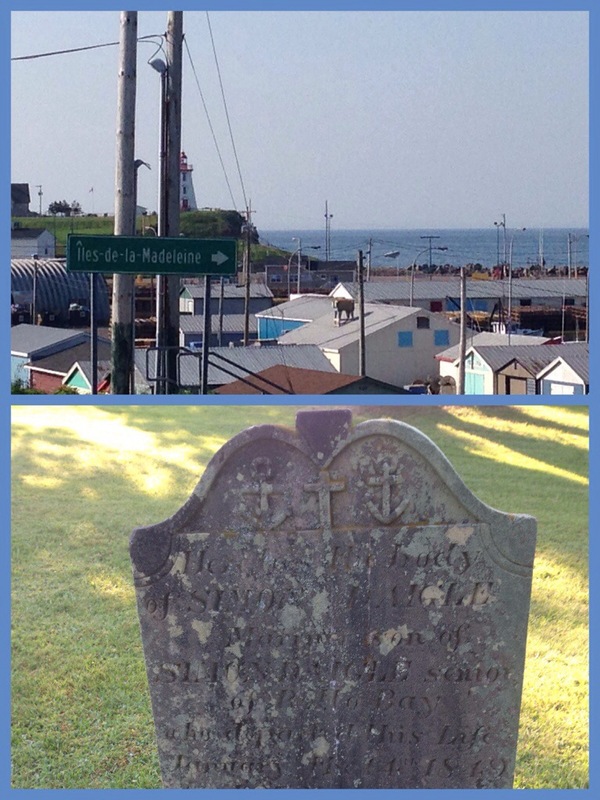 The picture of the tombstone was in a little park in West Souris where the Acadians settled in 1800 or so. 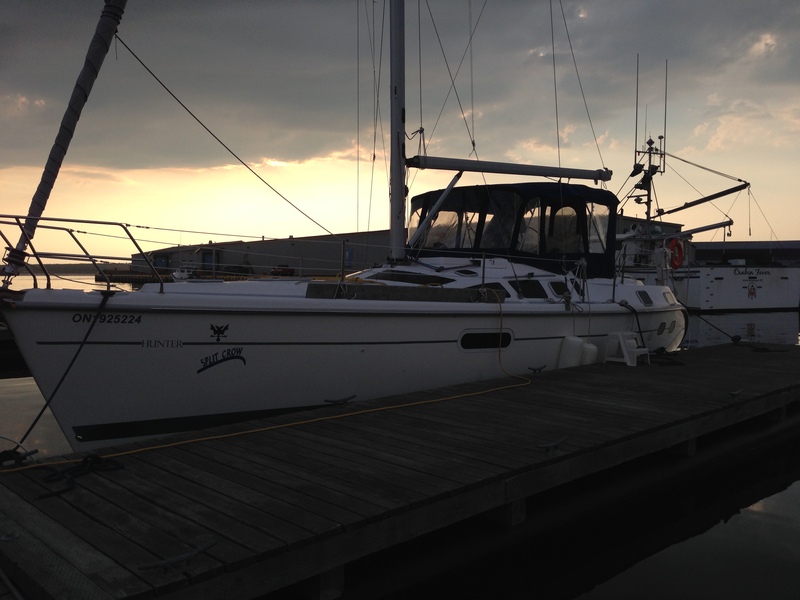 Good news about the bimini. Eric Gallant’s sister is going to sew up the holes and even in almost the same colour! We were worried about this because it would not be fun to be out on the water with no protection from the sun or rain. So, we will pick it up tomorrow. 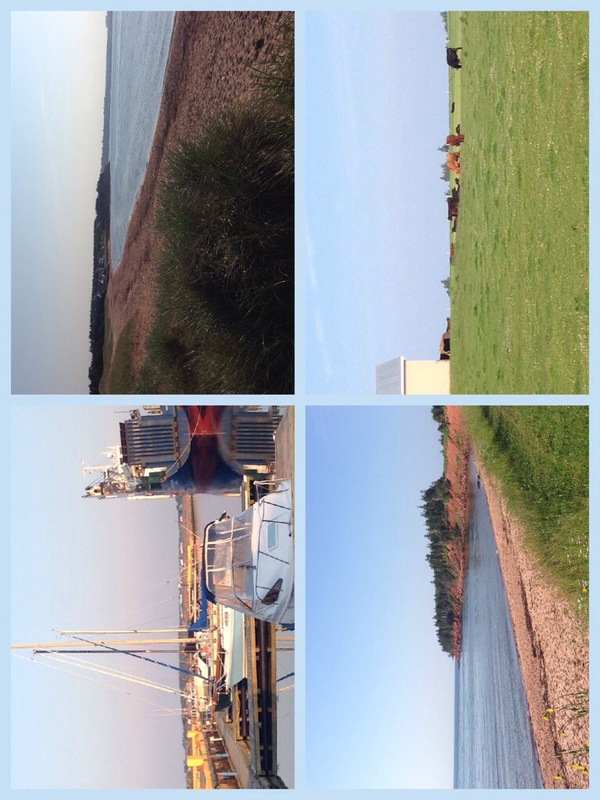 We arrived yesterday (June 29th) in Souris at about 5:30 after two days of driving. It was good to get out of the car! We left Parry Sound at 6:45 am on Saturday, June 28th and drove down the 400 to the 401 East. 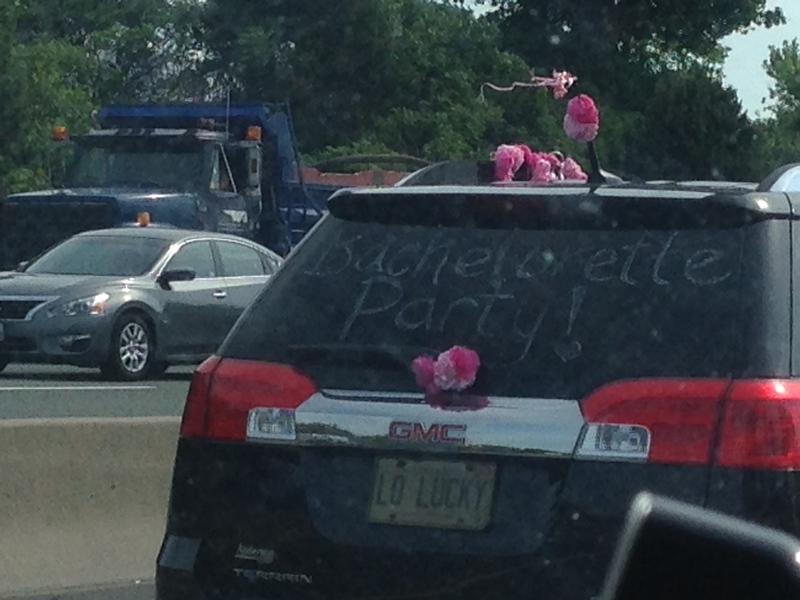 We got caught in a traffic jam at around Pickering but had a good laugh watching the “bachelorette” car for a few kilometres. We stopped a few times at the On Route highway stops and each one was really busy! I guess half of Ontario was heading to the East Coast. The weather though was great – nice and sunny the whole way. We got the Quebec border without any problems. Since we had come from Toronto instead of Ottawa, we managed to miss Montreal altogether! We just bypassed it and kept to the southern side of the St. Lawrence. I would totally recommend that route since we always, always get lost in Montreal! We headed along the St. Lawrence and enjoyed the drive. The traffic had thinned out so we were able to be more relaxed. 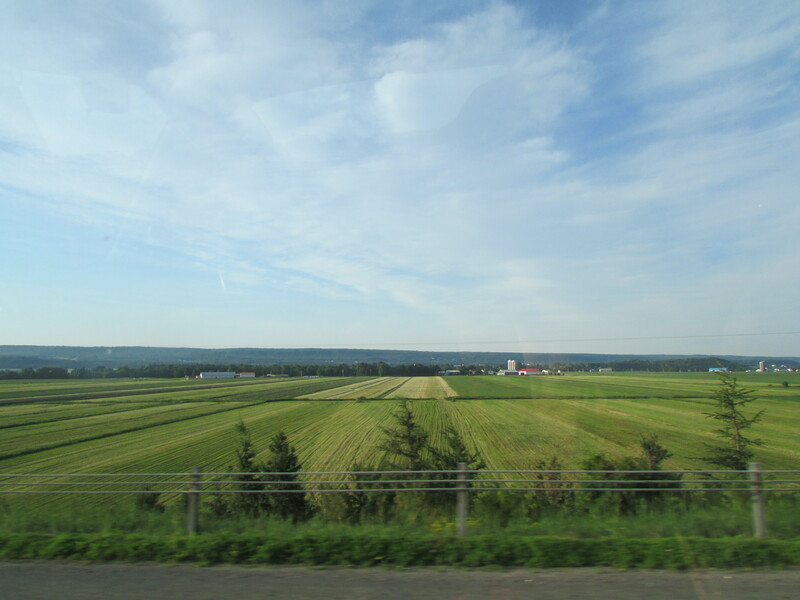 Here is a picture of a farm along the St. Lawrence. We missed the exit to Levis and ended up crossing the St. Lawrence to Quebec City but luckily the GPS had us very quickly go back over the bridge and find our way. We stayed in Levis overnight and left at 6:00 am on Sunday. 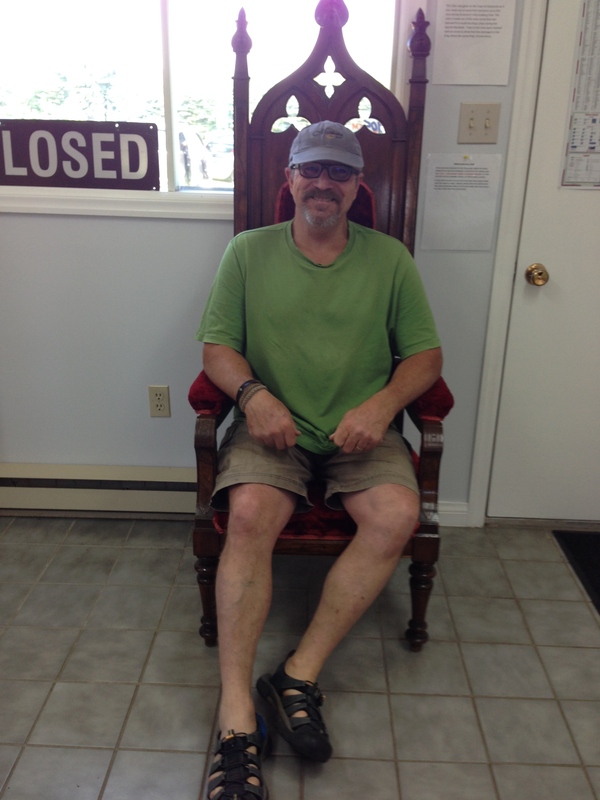 The ride was uneventful – we stopped at the Information booth in Oromocto, New Brunswick and I got a picture of “Joffrey” on his throne. 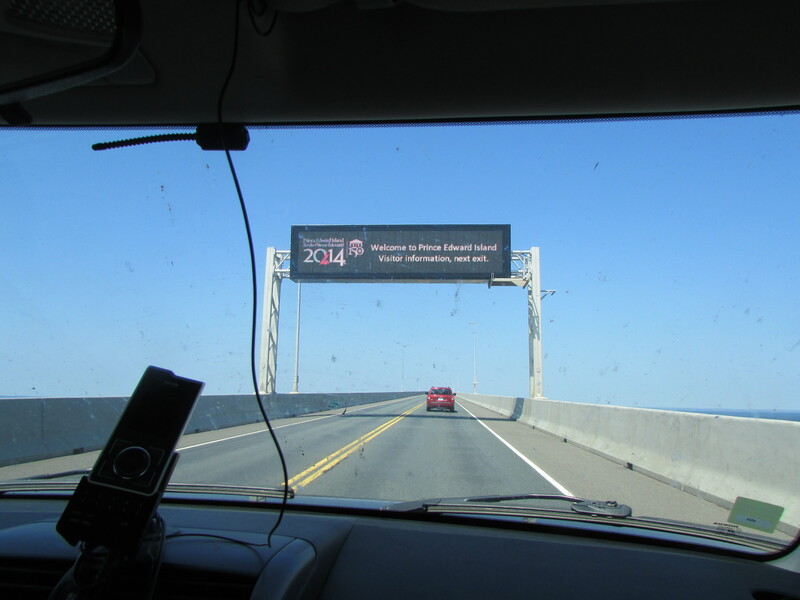 We arrived at Confederation Bridge at around 4:00. 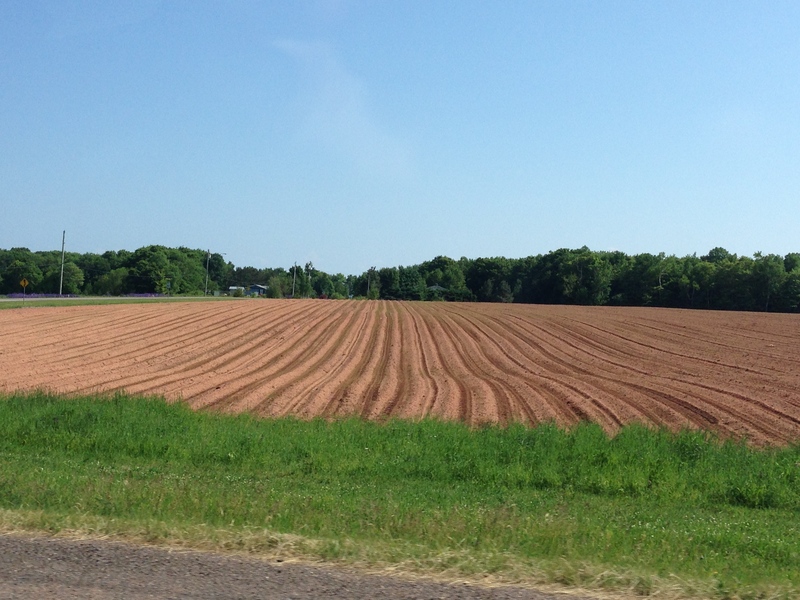 Here’s a picture of red soil of PEI! We got to the boat and started working right away. The tarp had been blown off so there is damage to the bimini. It’s too bad that I didn’t have my sewing machine because I could have patched it. We will have to find a canvas shop. 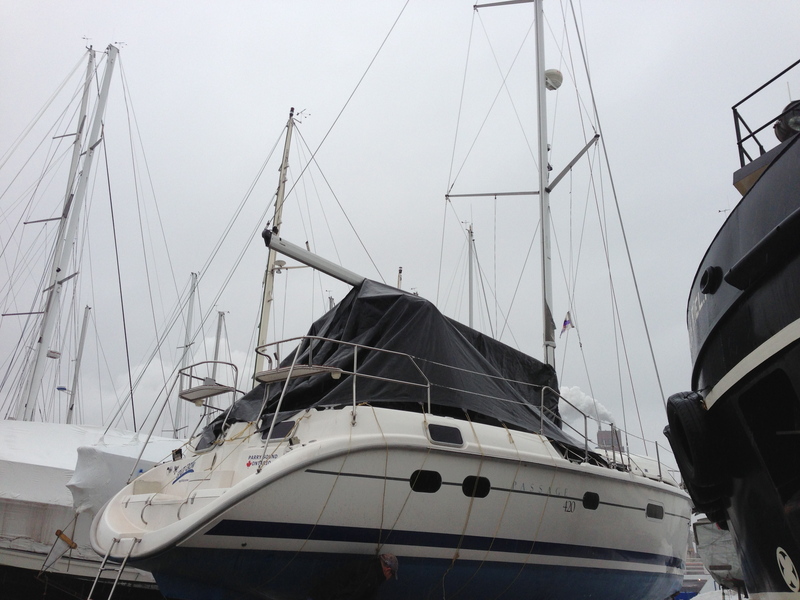 The boat itself was in good shape – just lots of cleaning to do! 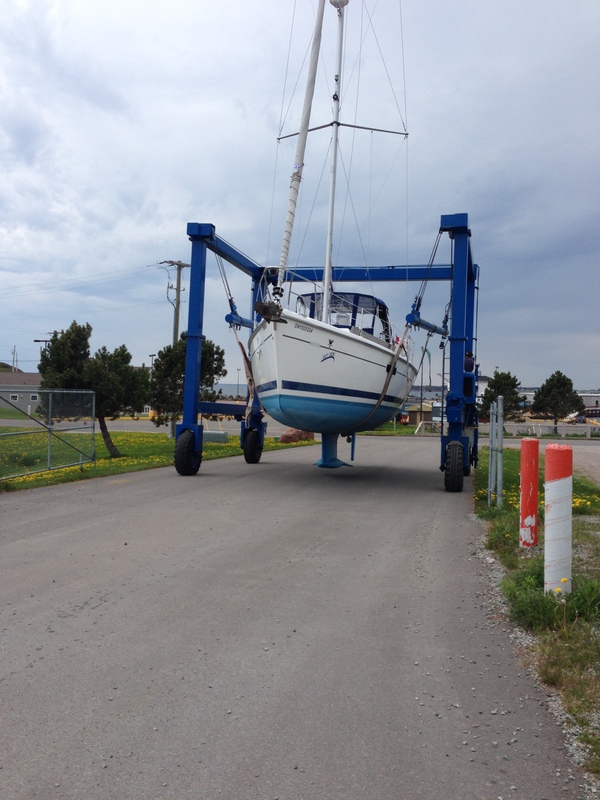 So, today and tomorrow, we will be working on the boat and getting it ready to launch! The weather is great and our friends that we met in Rimouski last year have been here for a week – they’re right beside us. Posted by JH on June 30, 2014 in Everything Else! I left Parry Sound this morning – drove to Nick’s house in Barrie and got a ride with the Simcoe Airporter Service. Here is a picture of Nick and my mum and dad – they’ve been visiting for a few days and will stay at the house for another week or so. I have to say that I really would recommend the Airporter service as it was so nice and relaxing to get to the Toronto airport instead of worrying about the holiday weekend traffic. The dispatcher was constantly giving the driver updates on the traffic so that he could take another route if need be. He was experienced and confident and for $62, it was totally worth it. Just look at the traffic going north! So, I boarded the plane at 3:00 and my seatmate was a second mate of a cargo ship for Algoma Shipping. We discussed quite a few things about the St. Lawence and the Great Lakes. Thank goodness Dennis was waiting at the Quebec airport as my bag was pretty heavy. He was dressed in fleece and had socks and sandals on (which I quickly adopted because it is so cold here!). I checked out the boat and certainly would recommend sending someone ahead as the advance party because it looks pretty good! He did a lot of work in the two weeks that he was here alone. So, we wandered town and saw the sights (dressed in fleece and socks and sandals). More to come tomorrow. Posted by JH on June 29, 2013 in Everything Else! Well, we drove all the way to Quebec City on Monday, March 11th. It was a long drive there and we only got lost once in Montreal. Thank goodness for the GPS! 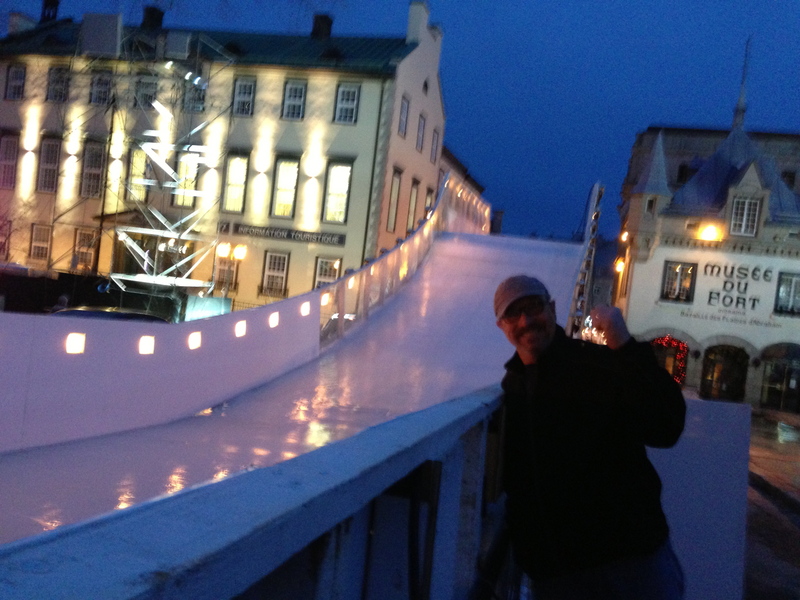 We wandered around Quebec and saw the sights in winter – slightly different – that’s for sure! Still very nice and not as many tourists. 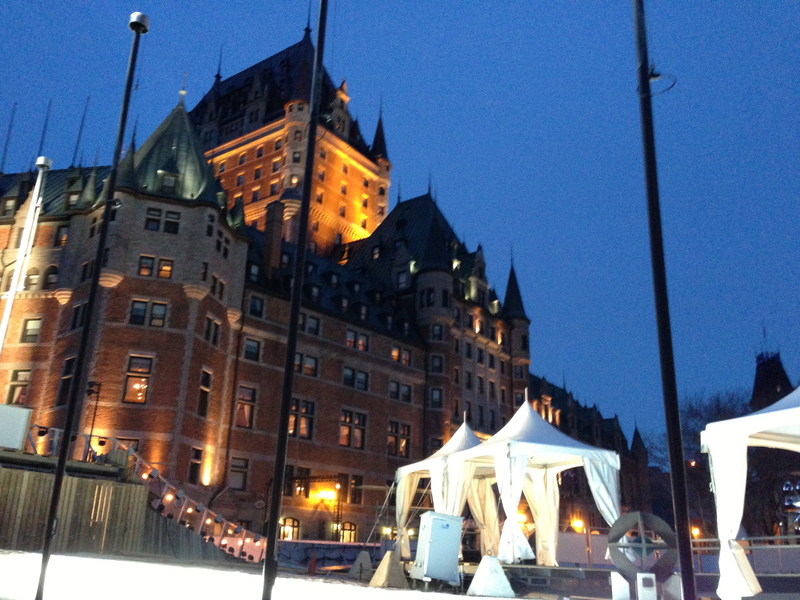 Here is a picture of the Chateau Frontenac at night as well as a photo of the skating course for the Red Bull Crashed Ice. I can’t imagine doing this! On Tuesday, it poured rain all day. Our visit to see the Split Crow was uneventful. 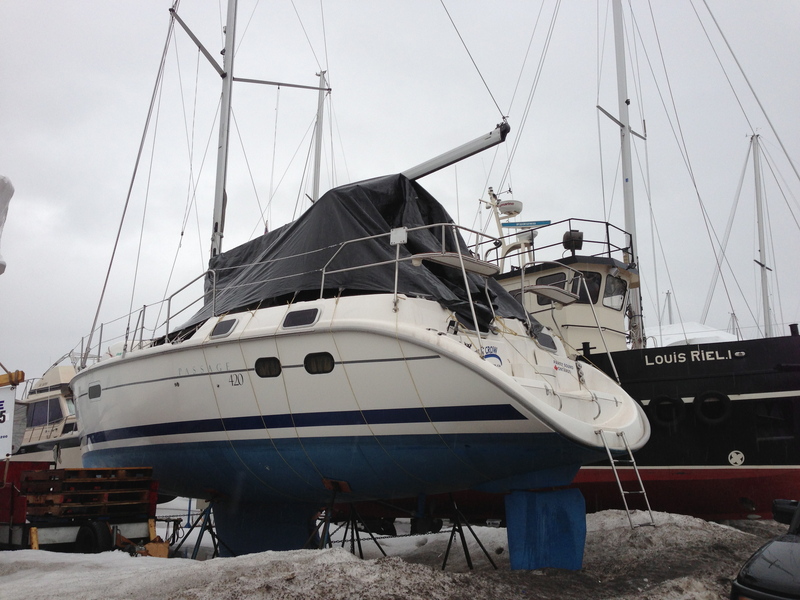 The boat is safe and was winterized well by the staff at Global Marine. I would recommend them to look after your boat. The Split Crow is very dirty on the outside though, from being in the city in the winter as well as being right on the St. Lawrence. Dennis will have a lot of work to do in June! 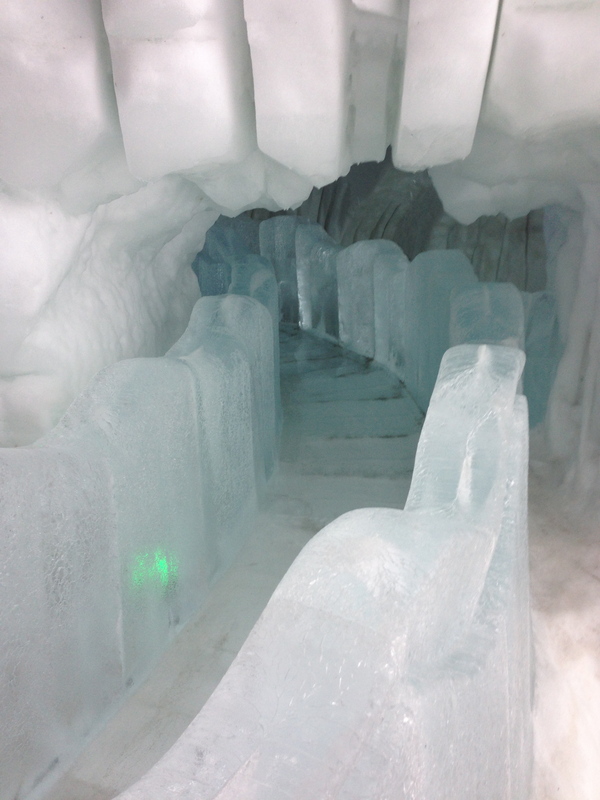 We also went to the famous ice castle in Quebec and it was definitely worth the visit. You can actually stay overnight! They provide a nordic sleeping bag for you as well as a room at the Sheraton (in case you get cold!). There are about 40 rooms with beds made out of ice and artwork carved into the walls – dinosaur skeletons, mythical creatures, etc. There is even a suite with a fireplace, a private hot tub and sauna! It was a good tour but not somewhere I would like to stay overnight – perhaps Glen would as he likes winter camping! 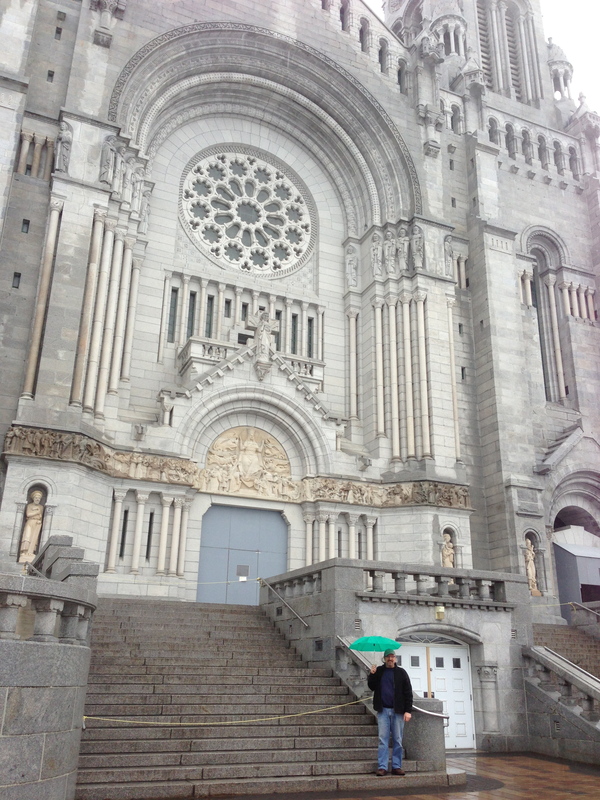 We drove to Saint Anne de Beaupre and toured the beautiful church. It is very big and spectacular – I can’t imagine the work that must have gone into building it! 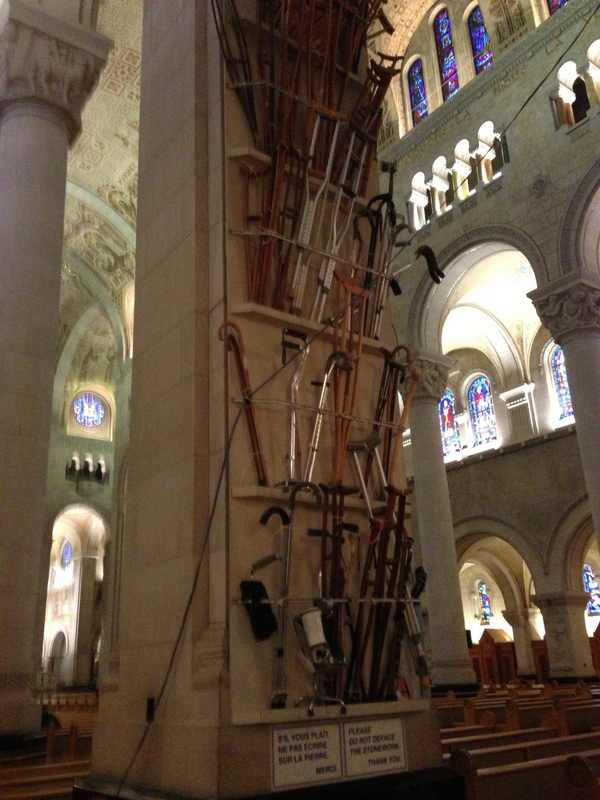 I really liked the wall of crutches and splints for those who experienced a miracle! 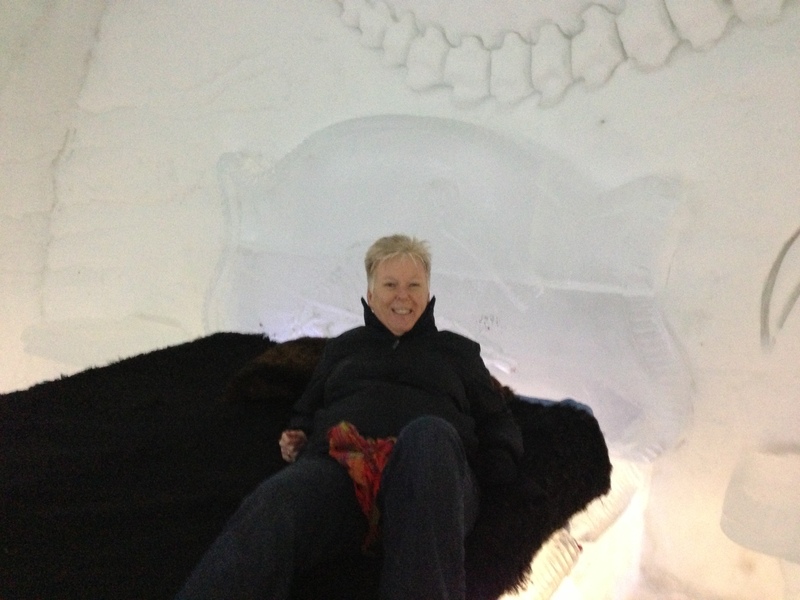 Jane sitting on an ice bed in the castle – a little cold! runs for us. When we first went up, we were covered in fog (since it had rained the previous day), so it was an adventure getting down the mountain. After a couple of runs though, the fog cleared, the sun came out and we had amazing views of the St. Lawrence! 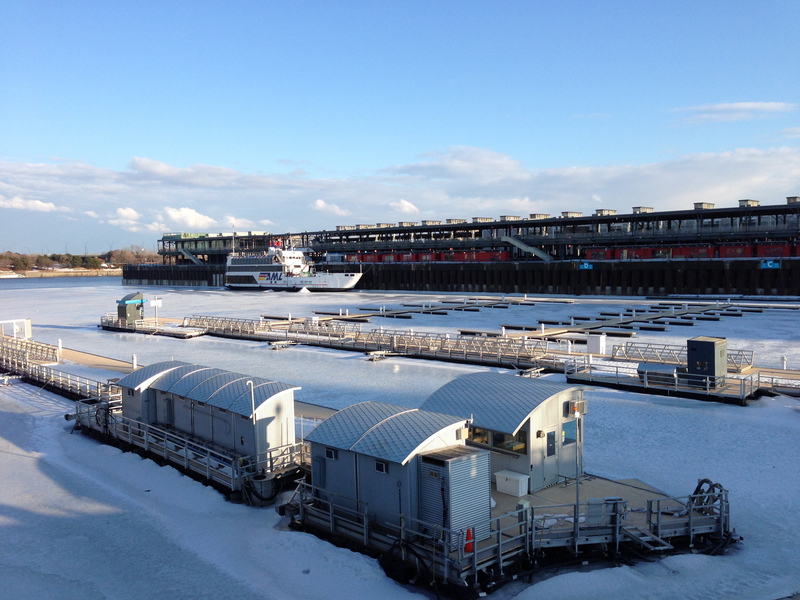 We drove to Montreal and visited the old port to see how it looked in the winter. Not quite as busy! 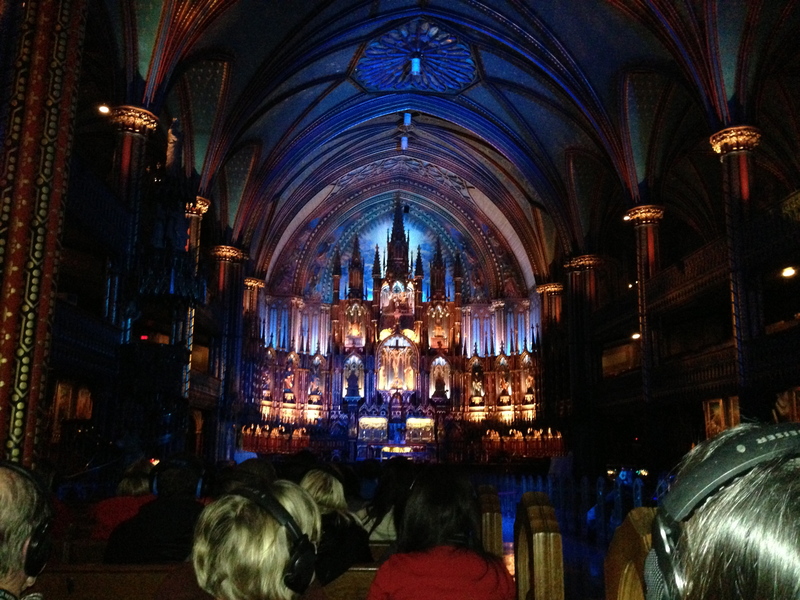 We went to Basilica Notre Dame for a light show that told the history of the church. Very worthwhile! Even Dennis was impressed! The show was about half an hour long and then we toured the church. In all, it was a good trip although we did a lot of driving! 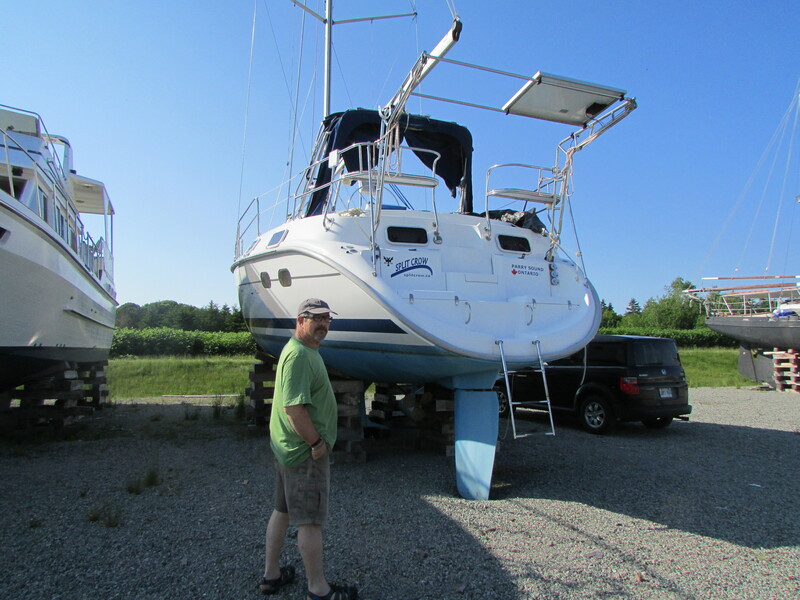 The plans are starting though, for our next adventure – down the St. Lawrence and over to the Magdalene Islands, PEI and possibly Nova Scotia. Posted by JH on March 15, 2013 in Everything Else!